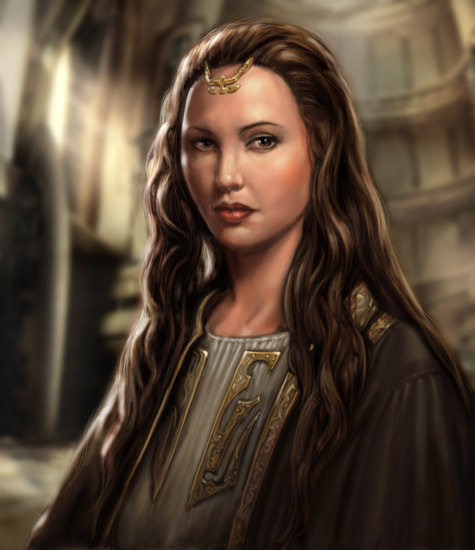 Crossing Zebras welcomes wormholer, lore expert and award-winning writer Rhavas. He is probably best known for his blog, Interstellar Privateer, but also his involvement in the Arek’Jaalan project, among other things. Today he sheds light on the infamous Seyllin Incident – enjoy! With the release of EVE Online: Rhea, numerous events have brought stellar explosions (i.e. Caroline’s Star), shattered planet systems and the Sisters of EVE to a prominence in lore that they haven’t enjoyed since YC111 (2009), at the launch of the Apocrypha release and the introduction of wormholes. Given the resurgence of interest in lore specifically around the shattered systems and Thera, the new actions of Sansha’s Nation, the reinvigoration of Arek’Jalaan and launch of Project Prometheus, Crossing Zebras asked that I give a bit of historical perspective. Please be warned: this article is packed with spoilers if you have not read the books or the associated chronicles! To truly understand the big picture, we have to go back even further. It could be argued that you would need to start in YC108 (2006) and the short story Theodicy, but for simplicity and focus we will just go back as far as YC110 (2008), in the prelude to the Empyrean Age release. Early that year was the last time we saw a bright star across New Eden. Speculation was rife, but its cause was never determined. However, it did herald great events, much as the next bright star would in YC116 (2014). Among lore buffs, it was speculated later that the first bright star was in fact somehow linked to the breach of The Other into New Eden, and into the mind of the future Amarrian Empress Jamyl Sarum. The subject of The Other is a very hotly debated one, so I’ll keep this part brief: he is a virtual entity from the Sleepers’ VR enclave (“The Construct”) who has broken free by overriding capsuleer implants. The Other is fighting for control to bring the weapons of the ancients back to life and wreak mayhem. The tale of Jamyl Sarum’s resurrection (she had died in succession trials for the Imperial Throne) and The Other’s invasion of her mind is told in the book The Empyrean Age. (If you want a further understanding of their relationship, I recommend a review of the Chronicle And I Shall Hide. I also wrote a prize-winning piece of speculative fiction on the birth of The Other for this year’s Pod and Planet fiction contest.) The Other’s motives are unclear, but what we do know relevant to this topic is that he guided Jamyl Sarum’s hand, and led her minions to the first known cache of the key to our story: isogen-5. Isogen-5 is cited for a number of attributes, most notably that it is extremely rare and unstable. When it collapses, it gives off gamma radiation. It is only harvestable from blue stars, particularly O1 blue giants, but also the occasional B0 class star. The Empyrean Age notes that only rogue drones are able to harvest it, and only Terran canisters have been able to store it. At this early stage, we only learn of it as a source of immense power for an incredible weapon. The Empyrean Age lays out (in Chapters 36, 48, 52 & 53) the actions that the Other-infested Sarum took. Namely, she sent her minions in search of ancient technology that could be used to crush her foes. Guided by The Other, she sends scientist Marcus Jror to the EVE Gate, where he finds a hidden Jove cache containing the capabilities to build a weapon of massive destructive power. Meanwhile in T-IPZB in Delve, one of her Paladins finds the prophesied “ring of fire” – an isogen-5 cache in the shadows of the first planet in the system, overrun by rogue drones. 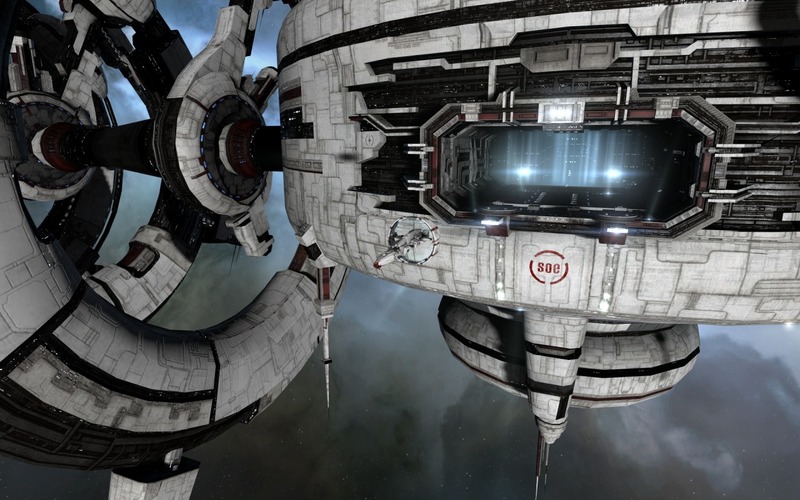 Not long after, they assembled the weapon on Sarum’s personal Abaddon battleship, stationed in MJXW-P, Delve. Her first test of the superweapon, and the power of isogen-5, was to break a blockade that the Blood Raiders had in place in T-IPZB. It was the first step in her return to power. 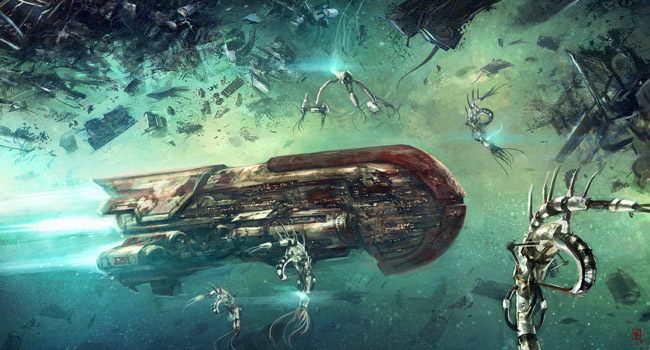 Twelve Apocalypse-class battleships waited outside the Matriarch Citadel … the thirteenth battleship – an Abaddon – broke the hangar’s plane. It was piloted by Her Majesty the Queen, the first voyage since her divine resurrection. History would one day record this moment as the birth of the Reclaiming. The sensation of Jamyl Sarum’s voice speaking within his own mind distracted Victor … It is done, she told him. The heathen blockade at the T-M0FA gate has been turned to dust. … Victor willed himself to remain calm. 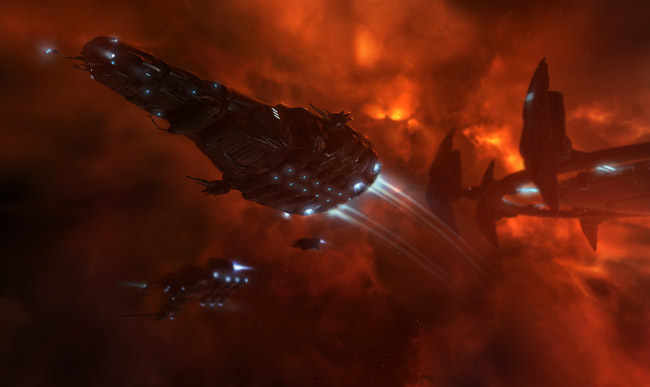 There were at least a hundred Blood Raider ships on that side of the blockade alone; Jamyl Sarum had to be commanding a fleet at least twice that size to break through so easily. Oddly, this obliteration of 100+ Blood Raiders by thirteen ships is not recorded in Empire public records, only documented later by capsuleers who found the graveyard. What happened next, however, was all over the news. The second firing of Sarum’s superweapon was in battle over Sarum Prime III (Mekhios). She obliterated a Minmatar Ragnarok Titan along with its attendant fleet, and sent the fabled Elders fleeing for safety, leaving another graveyard and guaranteeing her own ascension to the Imperial throne. While legends of her superweapon would persist ever after, Mekhios was the last time it was fired in anger. The empires and pirate factions began hunting for the weapon from that day on. Inevitably, of course, someone learned the secret of isogen-5-based power, and followed the traces to the Abaddon. But who, and how, is an interesting story all its own. This story is told in the six End of the World Chronicles, the first two of which, The Spiral and Half a Life, happen in the early months of the year. The Sisters of EVE, specifically the Sanctuary, picked up where Jamyl Sarum had begun. One of their researchers discovered that tiny disturbances in space-time were occurring around specific concentrated areas. First, at the EVE Gate, where the Terran artifacts had been. Then at Sarum Prime, where Empress Jamyl had been. But most prominently back at our old friend T-IPZB in Delve. And so, he went in search of a ship to discover the source of this signature, which of course turned out to be isogen-5. During the course of End of the World, it becomes evident that isogen-5 is unstable for a very specific reason. In certain circumstances (such as when you shoot it) it undergoes a reaction that makes it become what physicists would term negative-mass exotic matter. This is important because negative mass exotic matter is what physicists believe is necessary in order to create traversible wormholes. Without it, wormholes would either be one-way or collapse. So the destabilization of tiny bits of stray isogen-5 are what our Sanctuary researcher was able to find. The Sisters couldn’t afford to spare a ship, but the researcher found a willing, anonymous donor. It is strongly intimated that this ship was donated by the Blood Raiders, who refer to the Sisters as their “little hunters” – leading them off to easy victims at disaster locations. So off went the Sanctuary, followed by Blood Raiders. The pursuit was noticed by a Thukker captain from the protective vanguard of a large caravan. He was puzzled by what he saw, because the Blood Raiders appeared to voluntarily ignore the huge, juicy target of a caravan and chose to pursue a Sisters of EVE explorer instead. Sensing something unusual afoot, the Thukker decided to give chase as well. And so our merry line paraded off to Delve: the Sanctuary followed by the Blood Raiders, with the Thukker bringing up the rear, all on the year-old trail of the Rogue-Drone enabled Terran superweapon of a Sleeper-AI-possessed Amarrian Empress. The next three chronicles of End of the World: “1”, The Great Harvest and We Humans focus on the decisions that led to what would later be known as the Seyllin Incident – despite the fact that the decisive actions were all taken at T-IPZB in addition to the wormholes and shattered planets of the Apocrypha release (please note, if you want to enjoy these stories spoiler-free, go read them now! SPOILERS BELOW!). Each of the three chronicles describes the actions of one of the factions at T-IPZB. What they all found in that system was the same Rogue Drone-infested station from the previous year, now grown huge and bloated with massive quantities of isogen-5, and nestled up against the drone hive is Jamyl Sarum’s Abbadon. The Sanctuary took the first shot at recovering it. They knew the Rogue Drones could not be overcome by force with their lone ship, and that the broader Sisters of EVE may well not be interested in recovering it at all. So they decided to take a unique tack: negotiation. As they eased toward the Abaddon, they sent messages out to the drones about how the Sisters have been a positive force, would be the best caretakers of the technology, and should be allowed to proceed. The drones rip their ship open like a tin can and make short work of them. Watching this, the Blood Raiders became understandably concerned, and phoned home. No lesser than Omir Sarakusa himself informed the captain that they had a way around the drones, and instructed him to acquire Jamyl’s superweapon in order to wreak the worst possible destruction, an epic harvest, upon the empires. As if there were not enough players in the game already, another voice came on the line to give them codes that could neutralize the drones – a voice that at minimum belonged to a member of the Society of Conscious Thought, and potentially a Jovian. These codes did indeed override the Rogue Drone AI, but it was clearly a forced override. The drones visibly resisted its effects but were unable to overcome it, allowing the Blood Raiders to prepare the Abaddon for departure. And so, our Thukker captain was left with a conundrum. 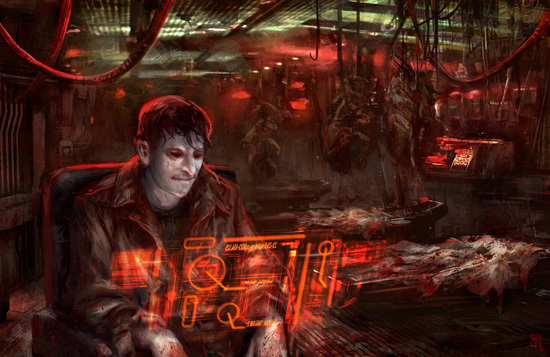 He could not himself compete for the superweapon through the armada of drones, and the clock was ticking on the Blood Raiders getting it operational. He too chose to contact his headquarters, and the Thukker leaders were surprisingly strident in their demand that he do nothing and go home (we’ll talk about this more when we get to the events at SL-YBS below). However, this captain chose an independent path, and his crew agreed to a noble sacrifice. They too communicated with the drones, but with a different message than the Sisters – namely that the drones could only find freedom from this new slavery through allowing the destruction of that which they guarded. The drones allowed the Thukkers close enough to fire upon the isogen-5 cache. “Neither [the Blood Raider or Thukker] captain knew that the immense stock of isogen-5 which detonated before their eyes was entangled with numerous stockpiles in even greater quantities, assembled for a very specific purpose, and deliberately scattered throughout the New Eden cluster and beyond. Nor could they know that the ancient race which had placed them there possessed not only a vision beyond the grasp of today’s science, but also the technological advancement necessary to realize its potential. The final chronicle, World on Fire, tells the effects of the Thukker captain’s actions. Along with several news announcements, it encompasses most of what is known as in-character fact. 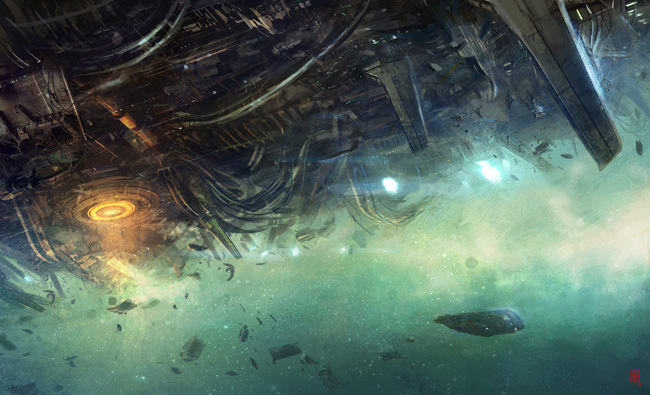 Those entangled caches of isogen-5 all exploded simultaneously, wreaking destruction across New Eden and beyond. CONCORD recorded ten “main sequence anomalies” (seen in this video at 0:32), although only four (Seyllin, SL-YBS, 3HQC-6 and 35-RK9) were known to the public in the early days and three others (the non-shattered systems of 5-CSE3, Y0-BVN and R79-I7) were never verifiably proven to be related. All of these systems began with a class O1 or B0 star. The first notice that anyone in the system got that something was wrong was a massive burst of gamma radiation that knocked out everything in its path, from satellites and fluid routers to stations. Simultaneously the magnetic fields of the stars were forcibly redirected, forming a channel directly from the star to the isogen-5 cache near the first planet of each system. The star convulsed under the shift, ejecting the bulk of its coronal mass down this channel, impacting on the planet and melting it to slag with explosive force. And thus the stars were reduced to class A0 and their first planets became shattered. 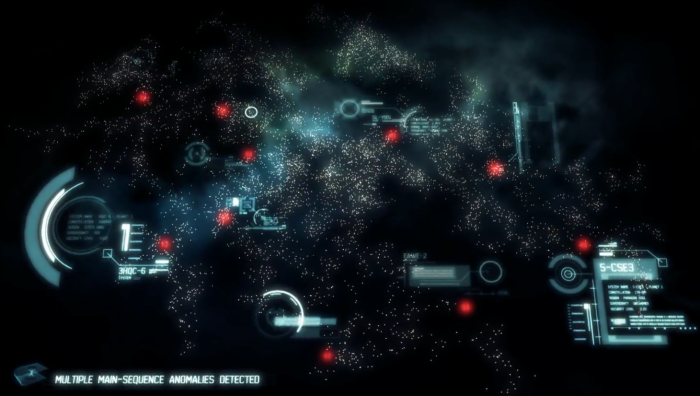 Thankfully, in most of the seven known-space systems that contained isogen-5 caches, populations were too scattered, distant or small to result in many casualties. We’ve already covered T-IPZB. Given their failure to capture the superweapon, the Sisters and Blood Raiders said nothing to the general public, nor did the Amarrians. At SL-YBS, an entire, huge Thukker caravan – the Lakat-Hro – disappeared. The Minmatar searched in vain for it, finding nothing. The amazing side note here is, that despite the massive destruction of the day, it appears that some or all of this caravan actually survived, finding a route into Thera, where a wrecked Lakat-Hro Hel supercarrier sits amid the devastation that would come in YC116 (2014). ORE announced the destruction of their expedition at 3HQC-6, and Serpentis of their assets in 35-RK9, but there was only silence from the Angels in Z8-81T or Sansha in EAWE-2 (in retrospect, and considering the evidence of the Lakat-Hro caravan’s movement, it is likely that the Sansha also found their entrance from EAWE-2 to what would become the Rhea release’s “shattered space”). Only one low-security Gallente system, Seyllin, was within the empires. The gamma ray burst disabled the Cassandra monitoring stations and knocked subterranean fluid routers offline. Thousands on the daylight hemisphere were killed by this burst – they “caught fire immediately and lived just long enough to realize it before their hearts stopped beating.” The first assumption was that this resulted from a nuclear attack. Anyone who survived the day would later suffer massive radiation sickness and likely death from its effects. Strange bedfellows came to aid the situation on Seyllin. For no clear reason Serpentis jumped into the fray to evacuate the planet alongside Gallente and CONCORD operations. Ultimately, their efforts were fruitless – when the coronal mass impacted the planet, nearly 500 million people perished in a blaze of molten rock and solar flame. And that, of course, is why the day is remembered as being about Seyllin, rather than T-IPZB. The massive detonation of isogen-5 across New Eden caused negative-mass events to ripple throughout the cluster, giving rise to the wormholes of today. The Sisters of EVE, calmly sweeping the Sanctuary’s bad day under the rug, announced the discovery of those wormholes throughout the cluster. The first one found by the empires was in the Gallente system of Vitrauze where a CreoDron astrophysicist named Lianda Burreau took her expedition in, only to discover the Sleepers. While related, that is a story for another day. During their early expeditions, capsuleers discovered two additional shattered planets in wormhole space, each also the innermost planet of an A0 star. It is still not known whether those two systems, J164104 and J115422, were affected as part of the Seyllin Incident or some other, older cataclysm. Finally, that leads us to Rhea. Thera (with its perhaps now unsurprising cohort of Sanctuary and Thukker inhabitants), the shattered wormholes (likewise with Sansha invaders), and their attendant A0 stars. In each of those shattered systems, Thera being the only exception, every single planet is shattered. In all of them, any planet within 70 AU of its sun (nearly twice the distance Pluto is from our own sun) was destroyed. This should give you an idea of the massive amount of energy behind Caroline’s Star and the events that must have, somehow, destroyed those 101 systems. Rhavas is a long-time member of C5 wormhole alliance Sleeper Social Club. His blog Interstellar Privateer has long had an area of focus around Sleeper lore and shattered planets in particular, along with game commentary and CSM analysis. He was the lead for Arek’Jaalan’s Project Tesseract and Project Catapult, and wrote the wiki page for Shattered Planets.